Fort DeSoto Park is a large spit of land just south of St Petersburg at the entrance to Tampa Bay. Shaped like a boomerang with each leg 2 1/2 miles long, the park offers five miles of white sand beaches on the Gulf side and five miles of marsh on the inland side. Beach access is unrestricted (except no vehicles) and access to the marshes is restricted to a couple hiking trails or by boat and wading the shallows. My access is limited to vehicle and hiking - I'm not much on wading in water I know nothing about and I have no easy access to a boat. 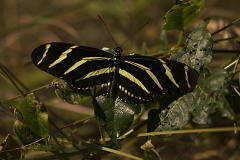 I had heard nothing but praise for Fort DeSoto Park as a nature conservatory ideal for photographers. Perhaps I needed a guide, but the island did not live to my expectations. I'm used to a density of wildlife they are running into each other. Here, with one exception, every picture came with a lot of luck. Click on any thumbnail for a larger version. 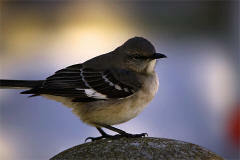 A Northern Mockingbird (Mimus polyglottos) - This one, just breeding age judging by the fading breast spots, is wisely wintering in the south with what appeared to be his/her mate. They were guarding the entrance to one of the beaches in the park. On one of the hiking trails I surprised a family of Raccoons. Momma and two babies were foraging in the pineland and were headed for the beach on the marsh side of the island. 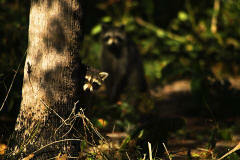 In the North, Raccoons are diurnal - meaning they forage at night. 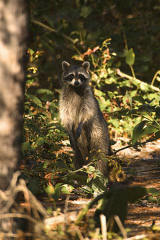 Southern coastal Raccoons are tidal - their best source of food is on the tidal flats exposed at low tide. So when the tide is out, they are hunting clams, mussels and other crustaceans living in the flats and in the mangrove root systems. There is a type of oyster that grows on the roots of the red mangrove that is one of their favorite foods. They also feed on anything else that may be trapped in the roots when the tide goes out. The picture on the left is of one of the babies suspiciously checking me out - you can make out Momma in the background. If you look on the left side of the trunk of the tree the young one is hiding behind, you can see a brown anole (a lizard) - another of their favorite foods. In the picture on the right, momma is challenging me until her young are safely behind her. 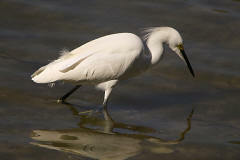 A Snowy Egret foraging in the shallows along a small inlet. This one is starting to show a little breeding plumage in the feathers on the back of the head. 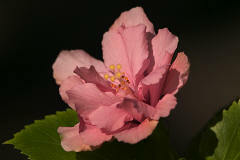 A Hibiscus found in the woods. You can find these growing wild in Florida.